This circuit is even simpler and employs a 6V feed from one of the stator connections on the vehicle’s alternator. This is connected to a 6V automotive relay (RLY1) which controls a Continuous Duty Solenoid (RLY2). This solenoid electrically connects or isolates the batteries. 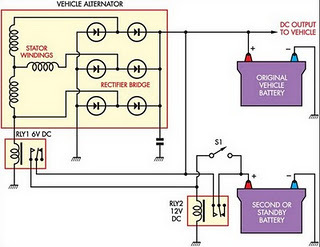 When the engine is started and the alternator stator voltage rises, the 6V relay turns on. This turns on the Continuous Duty Solenoid to connect the two batteries in parallel. As long as the engine is running, the vehicle’s alternator will maintain charge in both batteries. When the engine is shut down, the alternator stator voltage drops and the Continuous Duty Solenoid switches off, thus isolating the second battery from the vehicle’s electrical system. Provided that camping accessories are only connected to the second battery, the main battery should never discharge. Because the concept is entirely dependent upon the alternator’s stator output voltage, you cannot forget to turn the system on or off as it happens automatically.